Pisces, the last sun sign of the zodiac, has Neptune as its ruling planet. The planet of Neptune has been named after the Roman God of Sea and the deep, ocean blue color of the planet perfectly reflects this belief. The planet takes approximately 165 years to complete an entire circle around the sun. This means that it spends, on an average, about 14 years in each sign of the zodiac. Neptune was discovered by astronomers in 1846 and since then been associated with idealism, spirituality, imagination, mysticism, psychic phenomena and empathy. On the negative side, it is also identified with illusion, confusion and deception, extreme sensitivity and altered mental states. When the planet of Neptune was not discovered, Jupiter was regarded as the ruling planet of Piscean zodiac. Even today, some astrologers believe Jupiter to be a co-ruler of Pisces sun sign. Neptune passes on the qualities like spiritual development, romance, lyricism, wistfulness, compassion, insight and enhanced sixth sense, to those born under Pisces sun sign. The zodiac represents the talent to evolve from the material world to the spiritual world. Neptune rules the feet and is associated with angelica, iris, orchids, violets, water lilies, mosses, ferns, alder, ash, dogwood and fig and seaweed. The major colors related to the planet are silver, sea greens, mauve, purple and violet. The stone that seems to be the closest to Neptune is Amethyst, while the closest metals are germanium and strontium. For those who are born under the Pisces zodiac sign, Thursday is the lucky day and seven, the lucky number. Pisces is symbolized by two fish swimming in opposite directions. A part of you is always trying to “swim away” or escape reality. The other part is so intuitive that you get swept up in everything going on. Your imagination is the perfect hideout when you want to escape, since Pisces is so creative. You love dancing (Pisces rules the feet), movies, poetry, and music. Your moods are mysterious and your dreams are intense. Every Pisces should have a journal by your bed, since some your best ideas will come in your sleep. Although you can feel helpless, you’re much stronger than you think. The best way for Pisces to experience your own strength is to help people in need. You have great compassion and incredible healing powers. Because it’s easy for people to make you feel guilty, Pisces should watch out for friends who use you, or make you doubt yourself. Surround yourself with good-hearted friends who have their acts together. Many people born under your sign have a “tortured soul” quality. Finding a tranquil spiritual outlet, or spending time alone, can help you get re-centered in your own power. 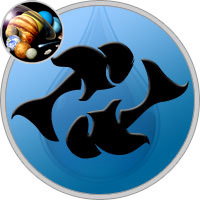 The ruling planets for Pisces are Neptune and Jupiter.